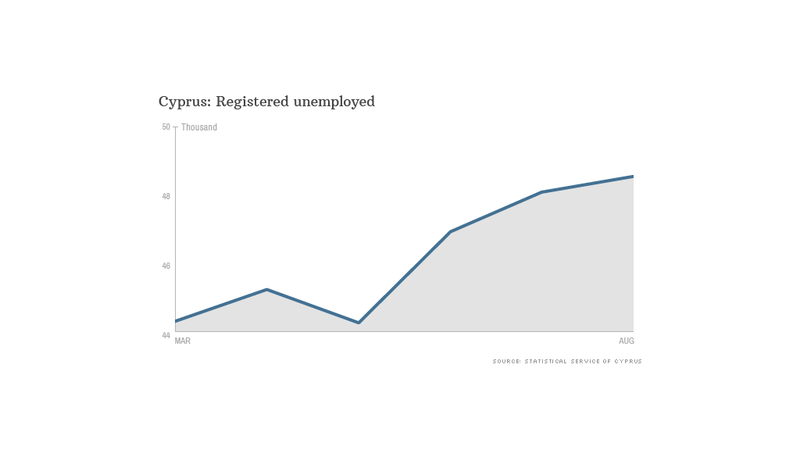 The number of registered unemployed people in Cyprus jumped by 43% over a year, while others who still have jobs are facing deep salary cuts in the range of 20% to 30%. 25% pay cuts. 40% increase in unemployment. Europe may be recovering but Cyprus is still battling for survival. Six months after Cyprus became the fourth eurozone country to need a bailout, the Mediterranean island's economy is shrinking rapidly as austerity measures bite, sending unemployment through the roof. Cyprus is the most potent example of a European country still struggling for economic survival even as the region claws its way out of recession. Unemployment has jumped by 43% over the past year. Constantinos Menelaou, a 28-year-old teacher at Casa College in the capital Nicosia, said he considers himself lucky that he still has a job, even though his salary was slashed by a quarter over the summer. Menelaou is stoical about his situation, saying he feels a sense of solidarity with many of his friends facing similar pay cuts, and losing their jobs. "There's no bright future. Day by day, things get worse," he told CNNMoney. "People are trying to get a job and they can't," he said, noting that frugal get-togethers in the island's cafes have replaced evenings out at a bar. Menelaou said many of his friends are starting their own small businesses or trying to leave the country, as they see little hope of finding work at home. Unemployment had been rising in the country over the past few years, but the situation turned dire in March. That's when Cypriot banks nearly collapsed, cash flows froze up and the country's lawmakers turned to the European Union and International Monetary Fund for a bailout. They agreed to an unprecedented €10 billion rescue package which included raiding Cypriot bank accounts with more than €100,000 on deposit to help fund a restructuring of the financial sector. Since then, cash withdrawals have been severely restricted -- individuals can only take €300 from their accounts each day -- as officials fear Cypriot banks could be drained without strict controls. Austerity measures have also been introduced to satisfy bailout conditions, with lawmakers implementing tax hikes and steep salary cuts in the public sector. Recruitment specialist Persis Christodoulou suffered with everyone else as the unemployment rate shot up to over 15% in the second quarter. "We used to handle 60 to 70 job openings per month in Cyprus in 2008. Now we handle 3-4, if we're lucky," he said. His family-run firm in Limassol -- Executive Connections -- slashed its workforce by 50% and was forced to move into a home office. "People woke up one day, they turned on the radio and were told they couldn't get access to their money," he said. "So you had to lay people off because you couldn't pay your employees. You couldn't import, you couldn't pay for electricity." Christodoulou said employers are still looking to cut back, with many firms considering asking staff to work a four-day week. Elmos Neocleous, who runs a TV production company in Nicosia, sums up his situation with stark numbers: "We used to make €500,000 a year. Now we make €50,000 a year. We used to have 12 employees. Now we have 2 ... There's no serious income anymore." "Everybody is disgusted with the system," said Neocleous. The Cypriot economy is expected to shrink by 13% over 2013 and 2014, according to the latest report by the European Commission. It's the only eurozone state expected to see a decline in GDP in 2014, and will have to wait at least until 2015 for a modest rebound.